The Crenshaw Northern Extension project has the potential to create a reliable, high performing regional north-south rail transit corridor. 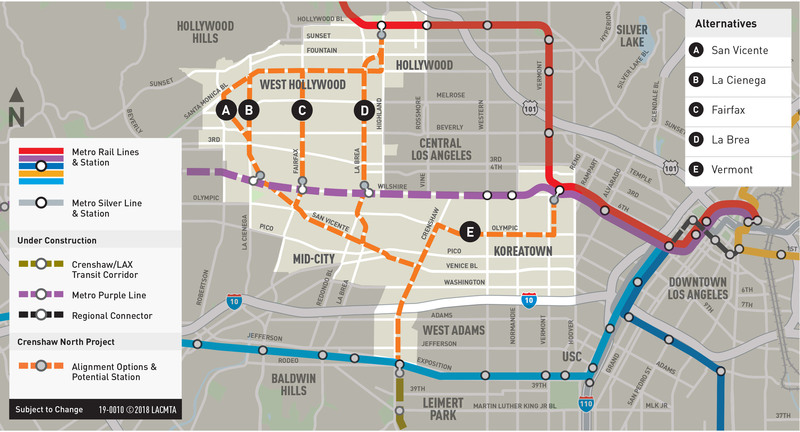 When combined with the Crenshaw/LAX Transit Project, currently under construction, the Crenshaw Northern Extension will connect the South Bay, LAX area, South Los Angeles, Inglewood and Crenshaw corridor to Mid-City, Central Los Angeles, West Hollywood and Hollywood, allowing for further connections to points north in the San Fernando Valley via the Metro Red Line. Further, the project would link four Metro Rail lines (Green, Expo, Purple and Red). Following a Feasibility/Alternatives Analysis of five potential alignments in 2018, Metro is now preparing an Advanced Alternatives Screening Study to gather public input and further analyze the five alignments to help determine which alternatives will be studied further in a subsequent environmental analysis. Measure M allocates $2.24 billion to the project, with a groundbreaking date of 2041 and project completion date of 2047. Metro is conducting this study now as there are efforts underway to identify funding to accelerate this schedule.